These three cheerful types were spied rather earlier on the trip, back in Paris almost a month ago, where I stopped to take some photos, in the rain of course, of self, Raven and the Arc de Triomphe. 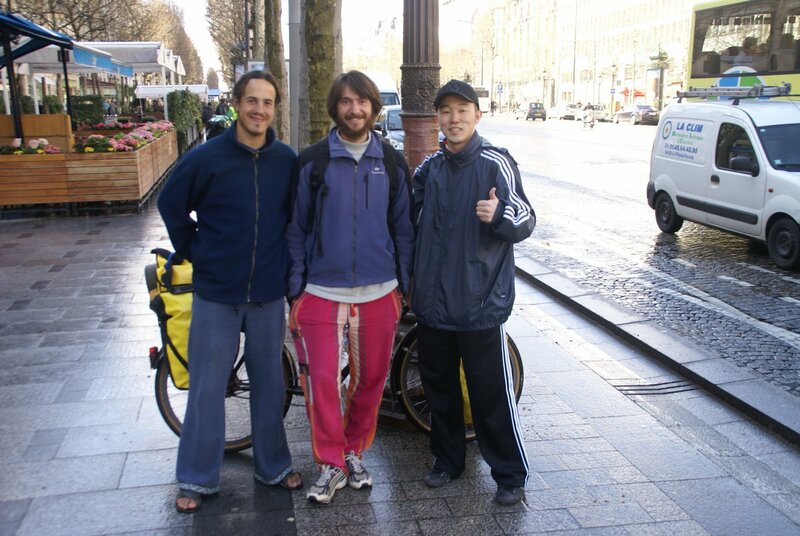 The two on the left started eyeing the bike with clear expertise, and when I greeted them en mauvais francais, they explained they had returned, literally the previous week, from a year and a half cycling together around South America, and were now planning writing projects and lecture tours. Did I, they asked when I explained that I was just setting out on a shorter European version, have a blog. Mais non, replied I truthfully at that point, whereupon we were joined by a determinedly cheerful young South Korean, see right in the picture, who had just bought a bike and panniers in Paris. And was setting out the following day on a three-month tour of Europe, through the Low Countries and Germany. There are clearly more of us demented cyclists out there than you would expect. Did I get their names? No. Bad journalist again. And if you’re wondering why this blog looks different, it’s because it’s from a Real Computer in Vienna, where I’m laying up for three days with Brigitte and Andy before continuing to Budapest by train at the weekend – just a short powered trip, honestly – to give my aching Achilles tendon a break. Unfortunate term. Shall we say, a rest.